A farewell is an expression of good wishes at a parting. “May the road rise up to meet you. May the wind be even at your back. May the sun shine warm upon your face and the rain fall softly on your fields. And until we meet again, may God hold you in the hollow of his hand”. 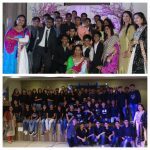 The auditorium of Sharada Mandir High School echoed with the blessings in the evening of 19th January 2019 when Sharada Mandir family came together to bid farewell to the outgoing 2018 batch of Std 10 students. 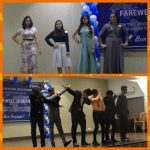 It was the evening of mixed emotions for all present at the school auditorium to witness the official send-off for the class 10 students at the valedictory ceremony 2019. The day was a fiesta devoted to the years spent together with friends and teachers to reminisce joyous moments. The Auditorium was festooned appropriately keeping in mind the theme “Bon Voyage” with blue and white balloons and grey stars, the backdrop painted in different shades of blue and white and dazzling lights. 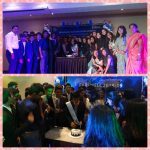 It was an incredible evening hosted and organized by class IX students, to bid farewell for class X students. This is to wish them a great future. The program started at 7.00 pm. Soothing messages by the principal & students of class IX was followed by dances. 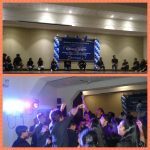 Captivating dance performance by the students was dedicated especially to the students of class X. Each student was given an interesting task, to perform. The highlight was a video presentation which threw fun and added life to the party. 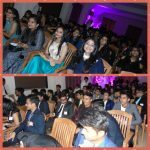 It was a beautiful evening as the batch of 2018 showed up, elegantly dressed in their finery. The young ladies glowed in fuchsia- coloured gowns whereas gentlemen carried themselves smartly in suits. 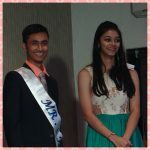 It was followed by ramp walk, where Mr. SMHS Samyak Mistry & Ms. SMHS Tanisha Amin were selected after accomplishing challenging tasks. The Selfie Corner with theme Bon Voyage was the main attraction not only for the students but for the teachers as well. 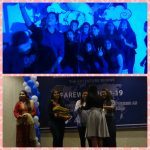 Vote of the thanks was given by class X students, to express their deep love and gratitude to the teachers and to class IX students for organizing farewell party with great enthusiasm. DJ party was followed by sumptuous dinner which endeavored to leave a trail of nostalgia. Finally the program came to an end at about 10 p.m. Memorable gift was given by Preprimary section, school management & student of class IX. Finally “School times are the best times, we cherish for the whole life”.